Atlas Commerce Center (“ACC”) is a Class “A” multi-tenant warehouse facility that is comprised of two 67,500 sq. ft. dock height buildings on 12 acres along Palmetto Commerce Parkway. The project is designed to accommodate users who require between 7,500 – 67,500 sf. ACC is being developed by a multi-generation real estate development family with over 60 years of experience in building and managing commercial and industrial properties. Our philosophy is to build a high quality product that exceeds current market standards so that the property will remain cutting edge well into the future. We do this for two reasons: 1) to provide our tenants with the best quality and value in the market; 2) our long-term investment horizon requires that our properties remain competitive for decades. Download our brochure for complete information. Atlas Commerce Center is located along the “Boeing Corridor” in the prestigious Palmetto Commerce Park, the area’s newest and largest Class A industrial park, and home to Boeing, Daimler Vans Manufacturing, Foodhandler, Cummins Turbo Technologies, Tighitco, IFA-Rotorion, Shimano American and Venture Aeorbearings. Conveniently located just minutes from I-26 and next to the newly opened Weber Dr. which provides even more direct access to I-26 and both the Port of Charleston and Charleston International Airport. Atlas Commerce Center has over 500 feet of frontage on Palmetto Commerce Parkway, with easy ingress and egress directly to the site from dedicated turn lanes and curb cuts on Palmetto Commerce Parkway. Atlas Commrece Center is being developed by a multi-generation real estate family with over 75 years of experience in developing, managing, and leasing commercial and industrial properties. Our philosophy is to build products that exceed the current market standards, so that our properties remain cutting edge well into the future. 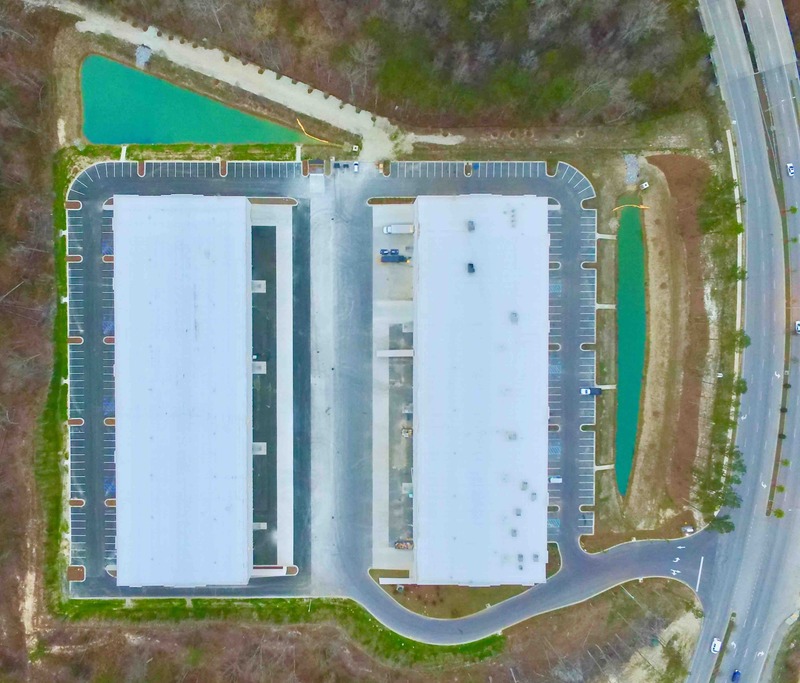 Atlas Commerce Center is the first project in the Charleston Market to offer a Class “A” product that is designed specifically to accommodate smaller and larger users alike in bay sizes that are divisible from 7,500 – 67,500 sf. The building’s unique design permits all tenant sizes to enjoy the amenities usually reserved only for larger tenants. Also, with our design we will be able to accommodate flex-space users who require more office and parking. Comprised of two 67,500 sf Class ``A`` warehouse buildings, each designed to be subdivided into bays as small as 7,500 sf. Each building is 450' wide x 150' deep with 50’ x 50’ column spacing, and 30’ – 36’ clear ceilings. 27 dock doors per building, each 7,500 sf bay has 3 doors with one designed to be converted to a street level drive in door. 120 auto spaces per building, that's nearly 2 spaces per 1,000 sf. A 200’ truck courtyard, allows even the largest trucks to maneuver easily. Both buildings are complete and available for immediate occupancy. Now is the time to act. Building 1 is fully leased and there is just 7,500 SF left in Building 2. Atlas Commerce Center has established itself as Charleston’s premier industrial project and Tenant’s are responding. Come join our growing roster of prestigious tenants. We assembled an experienced team from around the country that completed Atlas Commerce Center on schedule, and to the highest of standards. We are ready to provide custom buildouts so that the space meets your needs. Our contractor Miller Valentine Group has built over 65 million square feet of industrial facilities, including many for Fortune 500 companies. Our team also includes the civil engineering firm of HLA, Inc. and the architectural firm of James C. Hawthorn Associates. Together, we have built a best-in-class property that, 1) provides our tenants with the top quality and value in the market; 2) lives up to our long-term investment rule that our properties remain competitive for decades. Interested in learning more about the Atlas Commerce Center? Wondering if your business is a good fit? For more information, call Alan Bolduc at Avison Young -- 843-860-9566.